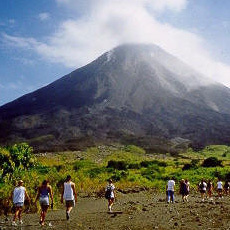 New Learning Academy’s services include not only Spanish classes, but also the arrangement of tours in Costa Rica. These tours are for those who want to truly experience this exotic and beautiful country. They can be arranged for your weekends off, or before or after you have completed your Spanish course. Relax and enjoy this all-inclusive resort located on the beautiful Tambor Beach in Ballena Bay. 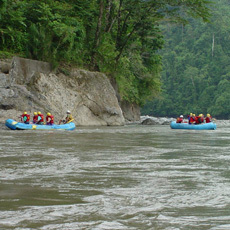 It is considered to be one of the best 5-star resorts in Costa Rica. Ideal for a family or couple that desires a worry-free vacation. 3 days, 2 nights. Price includes: round-trip transportation, all meals, unrestricted consumption of any brand of national drinks (with or without alcohol), entertainment and sports . Experience the beauty of expansive white sand beaches backed by an evergreen forest that grows right up to the high tide line. The perfect trip for those wanting both stunning beaches and walks through the forest. Don’t forget to look up—you’ll be accompanied by monkeys, birds, and the occasional sloth. 3 days, 2 nights. Price includes two nights , breakfast and dinner each day, entrance into the national park, and round-trip transportation. 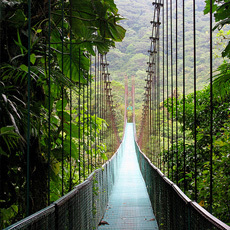 The Monteverde area is considered one of the most outstanding wildlife refuges in the New World Tropics. . Price includes luxury transport, lodging, meals each day, entrance to the hanging bridge and biological reserve, as well as visits to the cheese factory and hummingbird comedores. This is the most important area in the Western Caribbean for the nesting grounds of the green sea turtle (Chelonia Midas). Visit both the national park and the canals. 3 days, 2 nights. Price includes round-trip transportation, boat cruise on the canals, breakfast, lunch, and dinner each day, and two nights accommodation. We also offer a variety of ecological excursions and talks for those who are interested in learning more about Costa Rican flora and fauna. For example, we can arrange tours to bird, snake or butterfly farms, and visits to conferences about all kinds of interesting ecological topics. Contact us for more information. Take a day trip to Arenal to see one of Costa Rica’s greatest wonders and one of the few viewable active volcanoes on the planet. After viewing the volcano and the nearby La Fortuna Waterfall, you will visit the famous Tabacón hot springs, where you can relax in these soothing steam baths. Enjoy a lovely buffet dinner at the Tabacón resort before you return to San José. 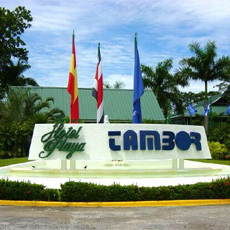 Price includes: bilingual guide, transportation, lunch, dinner, and entrance to the Tabacón Resort. 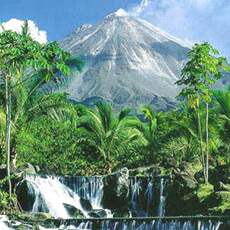 Arenal Volcano is one of the most active volcanoes in the Americas. 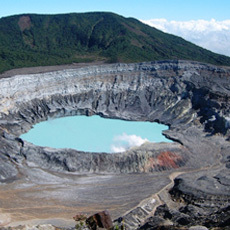 See this natural wonder close-up, walking on trails near the volcano and fishing for tilapias on Lake Arenal.. Price also includes use of hot springs, breakfast, and round-trip transportation. The Best of Costa Rica! 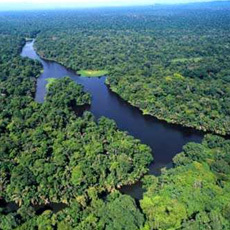 Visit Poás Volcano and Cloud Forest, La Paz Waterfall and Butterfly Garden, Sarapiquí River and Braulio Carrillo National Park. 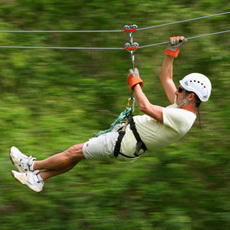 On this tour you’ll experience the most recommended sights in Costa Rica all in one day at a no-rush pace. The price also includes breakfast and lunch, round-trip transportation. 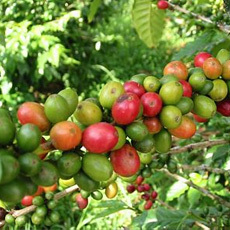 This half-day tour begins in an actual coffee plantation, then visitors are invited to the theater for a multimedia presentation describing the history of coffee and how it’s produced, from farming to the beverage we all know. Visitors then have the opportunity to shop at the Café Britt factory outlet. Price also includes lunch, round trip transportation, and a course on how to make cappuccino. Highly recommended! This is a once-in-a-lifetime experience in the rainforest . 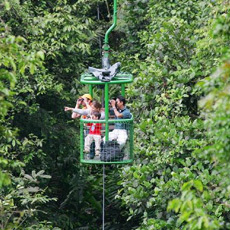 This tour is an extreme close-up look at nature, roaming through the canopy and getting a true bird’s eye view of the tropical forest. Price includes round-trip transportation, entrance to the park, and a bilingual guide. 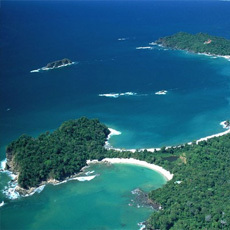 Located in the Nicoya Gulf, this island makes a lovely day trip. 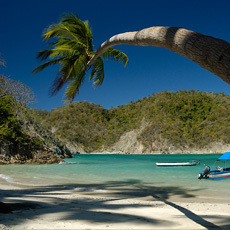 Enjoy the luxury of a cruise while spending time on an island with soft, white sand, beautiful blue water, and tropical dry forest. . Price includes land transportation from San José, bilingual guide, morning snack, water transportation, welcome cocktail, as well as tropical fruits and soft drinks, live music, and a barbecue lunch. Go on a fascinating excursion through the rainforest canopy and its hanging gardens of plants and animals hidden at the top of tall tropical trees! Price includes lunch, round-trip transportation, entrance to the park, a guided nature walk, and a guided tour on the Rainforest Tram. 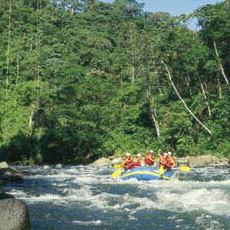 Experience the thrill of some of the finest white water in Latin America! Price includes equipment, breakfast and lunch, and round-trip transportation. Ideal for those who are testing themselves on whitewater for the first time. Price includes equipment, breakfast and lunch, and round-trip transportation.